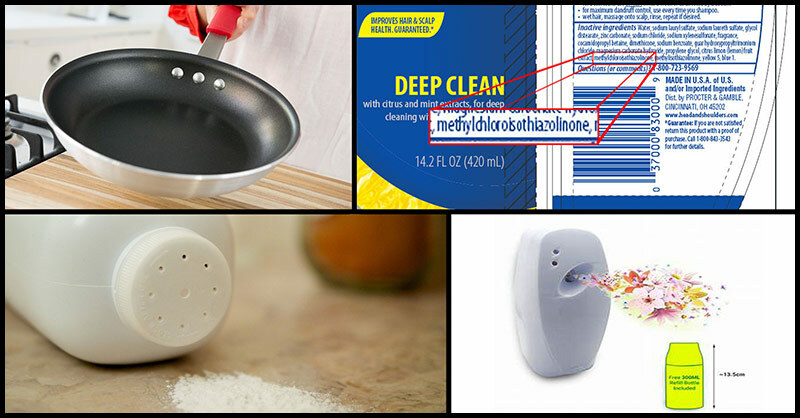 Nowadays, tons of conventional products which are present in your homes can cause cancer. These conventional products, from shampoos to cleaning products, are filled with toxic chemicals. Head & Shoulders, in particular, contain synthetic colors, fragrance, and SLS, amongst a myriad of other chemicals in the toxic cocktail that makes up their conditioners and shampoos. Plus, some of their shampoo products also contain methylchloroisothiazolinone, which is a potential mutagen. Many baby powders contain high amounts of talcum powder. Talc in its natural form contains asbestos, which can cause cancer. The talc-based baby powder produced by Johnson and Johnson is one of the most popular. The company has been sued many times and has paid millions of dollars to those who claimed their baby powder caused their cancer. Among the sweeteners in many products, aspartame is one of the most prevalent one being used. Aside from being common in diet sodas, aspartame is often added to energy drinks, milk products, juices, teas, and other artificially flavored drinks. Aspartame has been linked to numerous health problems, including cancer. According to a study conducted in 2007, it showed that aspartame can cause breast cancer and leukemias/ lymphomas. Stay away from artificial sweeteners and try some of the natural alternatives such as Stevia, Xylitol, dates, Maple syrup, and organic sugar cane. Are you drinking from a plastic water bottle? Well, the chemicals within the plastic that are touching your lips can seep into your mouth, most especially if your water has been sitting in the bottle for a while. What’s worst is that when you left your bottle in a hot car. The heat expedites this chemical leeching. In order for you to be safe, just use a refillable water bottle or glassware as it is better for your own health as well as to the health of the environment. In order to clean your mouth, commercial toothpaste primarily use toxic substances. Ingredients found in a regular toothpaste can cause dental fluorosis, enamel damage, skin rashes, stomach ailments, and more. Fluoride, a known carcinogen, is one of the worst ingredients found in most conventional and “dentist approved” kinds of toothpaste. It was not actually been proven that it can prevent the build-up of harmful oral bacteria; yet, it has been proven toxic wherein long-term ingestion of it has been linked to bone, brain, and heart complications. For a more natural alternative, you can try using essential oils and water. You can even use natural disinfectants like pine and tea tree essential oils. Also, you can try brands like DoTerra or Saje Natural Wellness. As many corporations convince consumers they need different products to clean specific surfaces, most families have an entire shelf filled with toxic cleaners. People continue to buy into this corporate propaganda even though these products have toxic warning signs on them. Not only them are breathing these fumes while cleaning, but also their children and visitors. Household cleaning products have a chemical content known as 2-BE (causes reproductive problems), coal tar dyes (causes cancer and harms nervous system), ammonia (associated with kidney and liver damage), and the infamous “fragrance” or parfum. A non-stick cookware is created using a Teflon, which is a plastic polymer that will actually release toxins when heated at 450 degrees Fahrenheit or higher. A certain study found that once a cookware coated with Teflon is heating for only two to five minutes on a conventional stovetop, it can cause the coating to break apart and produce toxic particles and gases. By just inhaling these, people can become sick with what’s known as the Teflon flu. Different types of soaps often contain a wide array of chemicals. Whether it’s dish soap, hand soap, or body wash, conventional soaps often contain a wide array of chemicals. One example is antibacterial soaps which regularly contain Triclosan, a potential carcinogen. Likewise, conventional soaps often contain parfum/fragrance. Often found in laundry detergents are ammonia, naphthalene, phosphorus, enzymes, phenol, and sodium nitrilotriacetate, which can all cause sinus problems, itchiness, dryness, and rashes.